2 drawings on paper, lined and laminated (1 sheet) : ink, watercolor ; top image 3.25 x 5 in., bottom image 3.25 x 5 in., on sheet 9.5 x 6 in. 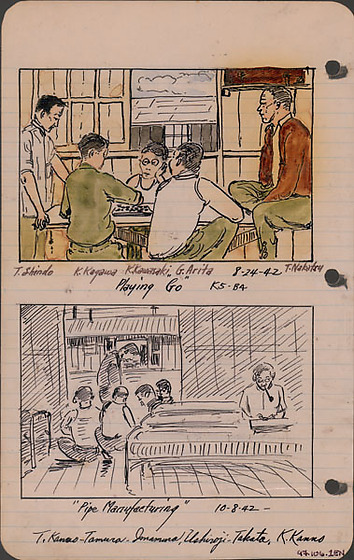 Ink and watercolor drawings of men playing go and making pipes in Lordsburg Justice Department Camp, August 24, 1942 and October 8, 1942 respectively. Both have black line borders. Top watercolor in hues of brown, green, peach of two men playing a Go game while other three men watch, identified left to right: T. Shindo, K.Kagawa, K.Kawasaki, G. Arita, T.Nakatsu. Kagawa, seated with back to viewer plays Go with Kawasaki, seated with back to window ; Shindo stands at left ; Arita sits next to Kagawa and Nakatsu sits on table. Top of another barracks and blue sky visible through window. Bottom sketch of four men seated on floor between bunks in front of open doorway manufacturing pipes while another man stands in doorway looking down. Another man with glasses and pipe in mouth is seated on one of three metal-framed beds at right doing something on a flat surface. Men identified left to right: T. Kanno, Tamura, Imamura, Ushiroji, Takata, K. Kanno. Another barracks visible through doorway in background. Drawing 97.106.1EM on recto of same sheet.